Unbelievable results with Herbalife. Go to goherbalife.com/nlamb. To see prices, sign up as a customer. Don't have to buy anything when you sign up. It's just a step you have to go through to see the prices. This site gives a 10% discount and because you are buying through an Herbalife distributor, your shipping and handling is very low. I love the protein shakes. I have lots and lots and lots of ways to make the shakes. Doesn't take much to give it a try. Very good results. Welcome.......you'll love the info you find here. All is well in the world of knitting and yes, there is always something new to learn. Here's to clicking needles!! This is giving me some encouragement. I will be having surgery this fall and I'll be sure to put aside my favorite projects for this down-time. Your work is simply gorgeous. Good Job!! I recently started knitting a lot and found I needed some patterns to get me going. Aside from the free patterns, I also responded to an email of Vogue Knitting patterns. I bought several patterns and after downloading them, I started my own knitting book of only the patterns I wanted to use. So, instead of the magazine, I just choose the patterns I like and then I don't have the magazines piling up like all my other magazines do. Hi. New to this site. Have been reading your entries for a while but today I wanted to respond. So, I registered and I am a knitter from Northern California. I'm not happy if my needles don't have yarn on them and I'm knitting something for people I know or people in my family. 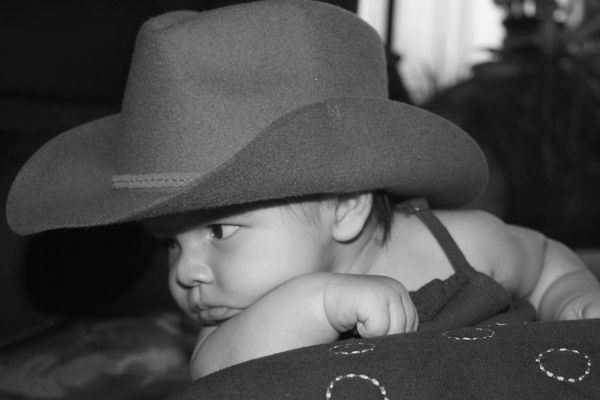 The picture is of my great granddaughter Cowgirl Annie.